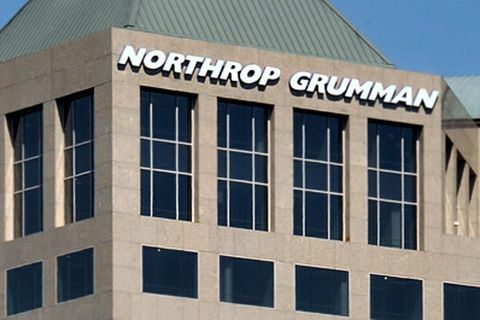 FALLS CHURCH, Va. – Jan. 29, 2015 – Northrop Grumman Corporation (NYSE:NOC) reported fourth quarter 2014 net earnings of $506 million, or $2.48 per diluted share, compared to $478 million, or $2.12 per diluted share, in the fourth quarter of 2013. Fourth quarter 2014 diluted earnings per share increased 17 percent and are based on 204.2 million weighted average shares outstanding compared with 225.2 million shares in the fourth quarter of 2013, a decrease of 9 percent. The company repurchased 4.5 million shares of its common stock in the fourth quarter of 2014 for $599 million. As a result of the passage of the Tax Increase Prevention Act of 2014, which extended tax benefits that expired on Dec. 31, 2013, the company recognized a full year research and development tax credit of $38 million, or $0.19 per diluted share, in the fourth quarter of 2014. For 2014, net earnings totaled $2.1 billion, or $9.75 per diluted share, compared to $2.0 billion, or $8.35 per diluted share in 2013. Diluted earnings per share for 2014 increased 17 percent and are based on 212.1 million weighted average shares outstanding compared with 233.9 million shares in 2013. During 2014, the company repurchased 21.4 million shares of its common stock for $2.7 billion. As of Dec. 31, 2014, the company had repurchased 42.2 million shares toward its previously announced goal of retiring 60 million shares of its common stock by the end of 2015, market conditions permitting. "Our team delivered another year of strong performance in 2014. We are excited about our many future opportunities and remain committed to generating value through sustainable performance, a well-aligned portfolio and effective cash deployment," said Wes Bush, chairman, chief executive officer and president. Fourth quarter 2014 total operating income and operating margin rate were comparable to the prior year period. Fourth quarter operating income includes lower segment operating income and higher unallocated corporate expense, partially offset by higher net FAS/CAS pension adjustment. For 2014, operating income increased $73 million, or 2 percent, to $3.2 billion. Operating margin rate increased 60 basis points to 13.3 percent. The improvements in operating income and margin rate reflect a higher net FAS/CAS pension adjustment and higher segment operating income, partially offset by higher unallocated corporate expense. The net FAS/CAS adjustment increase includes a $259 million decrease in FAS expense, principally due to an increase in 2014 discount rate assumptions. In addition, CAS pension expense decreased $158 million, principally due to passage of the Highway and Transportation Funding Act of 2014, which includes provisions that resulted in a reduction in the amount of CAS pension expense charged to the company's contracts. Total backlog as of Dec. 31, 2014, was $38.2 billion compared with $37.0 billion as of Dec. 31, 2013. For 2014, new awards totaled $25.0 billion, and book-to-bill was 104 percent. 1 Non-GAAP metric — see definitions at the end of this press release. Fourth quarter 2014 cash provided by operating activities totaled $1.5 billion compared with $1.2 billion in the prior year period. Fourth quarter 2014 free cash flow 1 provided by operating activities totaled $1.2 billion compared with $1.0 billion in the prior year period. The company's 2015 financial guidance is based on the spending levels provided for in the Bipartisan Budget Act of 2013 and the Consolidated and Further Appropriations Act of 2015. The guidance assumes no disruption or cancellation of any of our significant programs and no disruption or shutdown of government operations resulting from a federal government debt ceiling breach. Guidance for 2015 also assumes adequate appropriations and funding for the company's programs in the first quarter of the U.S. government's fiscal year 2016. 1 Non-GAAP metric - see definitions at the end of this press release. Fourth quarter 2014 federal and foreign income tax expense declined to $195 million from $229 million, and the company's effective tax rate declined to 27.8 percent from 32.4 percent in the prior year period. As a result of the passage of the Tax Increase Prevention Act of 2014, which extended tax benefits that expired on Dec. 31, 2013, the company recognized a 2014 research and development tax credit of $38 million, which reduced fourth quarter 2014 tax expense and effective tax rate from the prior year period. For 2014, federal and foreign income tax expense declined to $868 million from $911 million in 2013, and the company's effective tax rate declined to 29.6 percent from 31.8 percent in 2013. The company's lower effective tax rate in 2014 reflects a $51 million benefit for the partial resolution of its 2007-2009 Internal Revenue Service examination. Aerospace Systems fourth quarter 2014 sales increased 4 percent principally due to the timing of volume across a number of programs. For 2014, sales were comparable to 2013 and include $75 million realized for settlements of certain legal claims related to use of the company's intellectual property and a terminated program. Excluding the settlements, sales were slightly lower than 2013 due to lower volume for unmanned, space and military aircraft programs. Aerospace Systems fourth quarter 2014 operating income increased 7 percent and operating margin rate increased 30 basis points to 11.8 percent. Higher operating income and margin rate for the quarter are principally due to higher sales volume and improved performance. For 2014, operating income increased 8 percent and operating margin rate increased 110 basis points to 13.2 percent. Higher operating income and margin rate are principally due to the $75 million realized for the settlements described above and to improved performance. Electronic Systems fourth quarter and full year 2014 sales decreased 3 percent. Lower fourth quarter sales include lower volume for land and self protection programs, including infrared countermeasures and laser systems, and domestic intelligence, surveillance and reconnaissance (ISR) and targeting programs. These declines were partially offset by higher volume for international programs. For 2014, lower sales are principally due to lower volume for land and self-protection programs, including fewer deliveries of infrared countermeasures and laser systems; lower volume for domestic ISR and targeting programs, including fewer combat avionics deliveries; and lower volume for navigation and maritime programs. These declines were partially offset by higher volume for international programs. Electronic Systems fourth quarter 2014 operating income decreased 6 percent, and operating margin rate decreased 60 basis points to 17.2 percent. Lower operating income and operating margin rate reflect lower sales and a lower level of net favorable adjustments than in the prior year period. For 2014, operating income decreased 6 percent, and operating margin rate decreased 60 basis points to 16.5 percent due to lower sales and a lower level of net favorable adjustments. In addition, 2013 operating income benefited from the reversal of a $26 million non-programmatic risk reserve. Information Systems fourth quarter 2014 sales decreased 3 percent, principally due to lower volume for command and control programs as a result of reduced funding levels and in-theater force reductions. These declines were partially offset by higher volume for ISR and cyber programs. For 2014, sales decreased 6 percent, principally due to lower volume for command and control programs and communications programs due to in-theater force reductions, reduced funding levels and the wind-down of various programs. Information Systems fourth quarter 2014 operating income decreased 8 percent and operating margin rate declined to 9.3 percent. Lower fourth quarter operating income and margin rate reflect lower sales and increased investments in international business. For 2014, operating income decreased 3 percent, and operating margin rate increased 20 basis points to 9.8 percent. Lower operating income reflects lower sales and the increase in operating margin rate is due to improved performance. Technical Services fourth quarter 2014 sales decreased 2 percent principally due to lower volume for integrated logistics and modernization programs, including Hunter and ICBM, and the Combined Tactical Training Range (CTTR) program. Declines in these programs were partially offset by higher international sales. For 2014, sales decreased 2 percent principally due to lower volume for the ICBM, Hunter and CTTR programs, partially offset by higher international sales, principally due to the acquisition of Qantas Defence Services in the first quarter of 2014. Technical Services fourth quarter and full year 2014 operating income and operating margin rate were comparable to the prior year periods. Northrop Grumman will webcast its earnings conference call at noon Eastern time on Jan. 29, 2015. A live audio broadcast of the conference call will be available on the investor relations page of the company's website at www.northropgrumman.com . This release and the attachments contain statements, other than statements of historical fact, that constitute "forward-looking statements" within the meaning of the Private Securities Litigation Reform Act of 1995. Words such as "expect," "intend," "may," "could," "plan," "project," "forecast," "believe," "estimate," "outlook," "anticipate," "trends," "guidance," "goals," and similar expressions generally identify these forward-looking statements. Forward-looking statements in this release and the attachments include, among other things, statements relating to our future financial condition, results of operations and cash flows. Forward-looking statements are based upon assumptions, expectations, plans and projections that we believe to be reasonable when made, but which may change over time. These statements are not guarantees of future performance and inherently involve a wide range of risks and uncertainties that are difficult to predict. Specific risks that could cause actual results to differ materially from those expressed or implied in these forward-looking statements include, but are not limited to, risks related to: the assumptions on which our guidance is based; our dependence on U.S. Government contracts; the effect of economic and security conditions in the United States and globally; changes in government and customer priorities, requirements and spending for our programs, products and services; government budgetary constraints; shifts or reductions in defense spending resulting from budget pressures and/or changes in priorities, sequestration under the Budget Control Act of 2011, as amended or replaced; a continuing resolution with limited new starts; the lack of or significant changes to annual appropriations legislation; debt-ceiling limits and disruption to or shutdown of government operations; timing of payments; changes in import and export policies; changes in customer short-range and long-range plans; major program disruptions or terminations; the acquisition, deferral, reduction or termination of contracts or programs; our non-U.S. business, including legal, regulatory, financial, security and governmental risks related to doing business internationally; the outcome of litigation, claims, audits, appeals, bid protests and investigations; our ability to recover certain costs under U.S. Government contracts; market conditions; our ability to access capital; performance and financial viability of key suppliers and subcontractors; interest and discount rates or other changes that may impact pension plan assumptions and actual returns on pension plan assets; the adequacy of our insurance coverage and recoveries; the costs of environmental remediation; our ability to attract and retain qualified personnel; changes in health care costs and requirements; changes in organizational structure and reporting segments; acquisitions, dispositions, spin-off transactions, joint ventures, strategic alliances and other business arrangements; possible impairments of goodwill or other intangible assets; changes in and the effects of laws and regulations that affect our business, including those relating to accounting, tax, defense procurement, corporate liabilities and international business; technical, operational or quality setbacks in contract performance; availability of materials and supplies; controlling costs of fixed-price development programs; domestic and international competition; potential security threats, cyber and information technology attacks, natural disasters and other disruptions not under our control; and other risk factors and other important factors disclosed in our Form 10-K for the year ended December 31, 2014, and other filings with the Securities and Exchange Commission. You are urged to consider the limitations on, and risks associated with, forward-looking statements and not unduly rely on forward-looking statements. These forward-looking statements speak only as of the date of this release, and we undertake no obligation to publicly update or revise any forward-looking statements, whether as a result of new information, future events or otherwise, except as required by applicable law. This release and the attachments also contain non-GAAP financial measures. A reconciliation to the nearest GAAP measure and a discussion of the company's use of these measures are included in this release or the attachments. New Awards — Total backlog as of December 31, 2014, includes $5.8 billion and $25.0 billion of estimated contract awards in the three months and twelve months ended December 31, 2014, respectively. Non-GAAP Financial Measures Disclosure: Today's press release contains non-GAAP (accounting principles generally accepted in the United States of America) financial measures, as defined by SEC (Securities and Exchange Commission) Regulation G and indicated by a footnote in the text of the release. While the company believes that these non-GAAP financial measures may be useful in evaluating our financial information, they should be considered as supplemental in nature and not as a substitute for financial information prepared in accordance with GAAP. Definitions are provided for the non-GAAP measures and reconciliations are provided in the body of the release. References to a "Table" in the definitions below relate to tables in the body of this press release. Other companies may define these measures differently or may utilize different non-GAAP measures. Pension-adjusted diluted EPS: Diluted EPS excluding the after-tax net pension adjustment per share, as defined below. These per share amounts are provided for consistency and comparability of operating results. Management uses pension-adjusted diluted EPS, as reconciled in Table 1, as an internal measure of financial performance. Cash provided by operating activities before after-tax discretionary pension contributions: Cash provided by operating activities before the after-tax impact of discretionary pension contributions. Cash provided by operating activities before discretionary pension contributions has been provided for consistency and comparability of 2014 and 2013 financial performance and is reconciled in Table 2. Free cash flow: Cash provided by operating activities less capital expenditures. We use free cash flow as a key factor in our planning for, and consideration of, strategic acquisitions, stock repurchases and the payment of dividends. This measure should not be considered in isolation, as a measure of residual cash flow available for discretionary purposes, or as an alternative to operating results presented in accordance with GAAP. Free cash flow is reconciled in Table 2. Free cash flow provided by operating activities before after-tax discretionary pension contributions: Free cash flow provided by (used in) operating activities before the after-tax impact of discretionary pension contributions. We use free cash flow provided by (used in) operating activities before discretionary pension contributions as a key factor in our planning for, and consideration of, strategic acquisitions, stock repurchases and the payment of dividends. This measure should not be considered in isolation, as a measure of residual cash flow available for discretionary purposes, or as an alternative to operating results presented in accordance with GAAP. Free cash flow provided by (used in) operating activities before discretionary pension contributions is reconciled in Table 2. Net FAS/CAS pension adjustment: Pension expense in accordance with Government Cost Accounting Standards (CAS) charged to contracts and included as cost in segment operating income, less pension expense determined in accordance with GAAP. Net FAS/CAS pension adjustment is presented in Table 1. After-tax net pension adjustment per share: The per share impact of the net FAS/CAS pension adjustment as defined above, after tax at the statutory rate of 35 percent, provided for consistency and comparability of 2014 and 2013 financial performance as presented in Table 1. Pension-adjusted operating income: Operating income before net FAS/CAS pension adjustment as reconciled in Table 1. Management uses pension-adjusted operating income as an internal measure of financial performance. Pension-adjusted operating margin rate: Pension-adjusted operating income as defined above, divided by sales. Management uses pension-adjusted operating margin rate, as reconciled in Table 1, as an internal measure of financial performance. Segment operating income: Total earnings from our four segments including allocated pension expense recognized under CAS. Reconciling items to operating income include the net FAS/CAS pension adjustment, as defined above, as well as certain corporate-level expenses, which are not considered allowable or allocable under applicable CAS or FAR. Management uses segment operating income, as reconciled in Table 3, as an internal measure of financial performance. Segment operating margin rate: Segment operating income as defined above, divided by sales. Management uses segment operating margin rate, as reconciled in Table 3, as an internal measure of financial performance. 1 Funded backlog represents firm orders for which funding is authorized and appropriated. 2 Unfunded backlog represents firm orders for which as of the reporting date, funding is not authorized and appropriated. Unfunded backlog excludes unexercised contract options and indefinite delivery, indefinite quantity (IDIQ) contracts until the time the option or IDIQ task order is exercised or awarded.